Kara Edwards has been looking over her shoulder for years. After being kidnapped and held hostage by a man who claimed to be her late husband’s friend, she’s no longer in the “trusting” business. 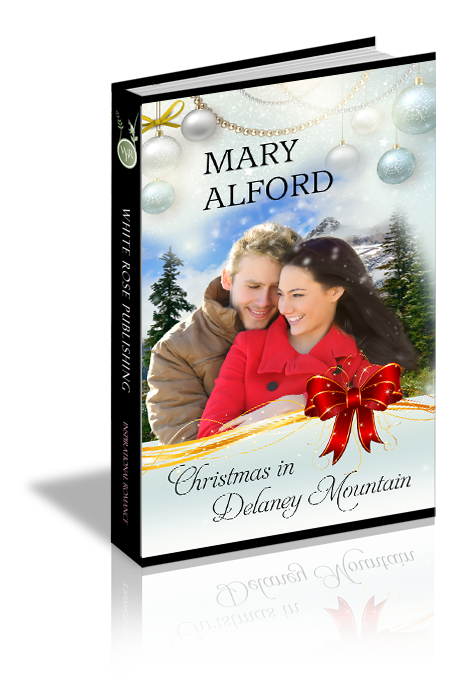 She moves to Delaney Mountain with one expectation: to outrun her stalker. Never does she expect to meet a man like David Delaney—one who not only makes her want to trust again, but to love again, too. David Delaney is drawn to Kara from the first moment he meets her. There’s an attractive strength behind her no-nonsense caution and independence. He knows Kara is running from something, but nothing prepares him for what she has to say. When Eli Redford escapes from prison, Kara and David find themselves on one side of a Christmas Eve showdown that brings everything to a deadly head. Two months. She’d spent the last two months looking over her shoulder and yet the expected nightmare hadn’t returned. There’d been no word from him. No sightings. Only silence. So why couldn’t she relax? Begin to enjoy life once more? Because this routine was a familiar one. The last time had been four months. The time before six. The only variable in the equation was that there was no variable. The routine‒his routine‒never faltered. So, no matter how tired, or frustrated, or fed up she became, she couldn’t let her guard down because it had only been two months; and she was convinced, even after moving to a remote village in Colorado, he would find her again. At times, Kara felt like a ghost without a past. Transparent. She barely remembered the woman she’d once been…before him. Kara glanced out the window at the gathering darkness. It came quickly at this time of the year in the shadow of the mountains. The news had been broadcasting a huge winter storm on the way. It was almost six. Amy would start to worry if Kara didn’t pick up her four-year-old daughter, Maya, soon. A familiar nervousness slithered down into the pit of her stomach. It reared its unwelcomed head every single time David Delaney came within twenty feet of her. It didn’t help that he was handsome and had bad- boy-troubled-past written all over him. His straight, dark blond hair had been hastily pushed back. He hadn’t shaved in several days. David’s stubble darkened his strong jawline, drawing attention to his face. She suspected he’d pulled quite a few all-nighters lately. When David had hired her, he’d explained that he and his brother were expanding their ranching business and had bought up several hundred acres of land across Delaney Mountain from the original ranch. David was charged with getting the new ranch up and running, which was huge undertaking, especially now that his brother had taken a leave of absence to be with his wife who was on strict bed rest during the final stages of her pregnancy. While David seemed to enjoy the challenge, the running of the entire ranch fell squarely on his shoulders, resulting in many long days….and nights. He’d told her that the ranch foreman, Noah Henderson, was a tremendous help, but still, the pressures had to be enormous. Kara glanced up, regretting the color that crept up her face. His amazing smoky-blue eyes were on her. His aftershave reminded her of how long it’d been since she was close to a man. And as always, her thoughts drifted to Bryce. She still missed him terribly. It had been almost five years since she’d buried her high school sweetheart, and the love of her life. Lately, it seemed life was reminding her of the things she’d lost with Bryce. Yet she just couldn’t picture going there with anyone else. Especially now. After she’d survived him. Kara squared her shoulders. She couldn’t afford to give in to an attraction. Her life and Maya’s depended on Kara never losing sight of the past. “Something wrong?” David asked in polite concern, while dropping the inch-thick manila folder he’d been working on most of the day on her desk. The slight whooshing sound it made grated along her frazzled nerves. He’d asked her to call him David when he’d first hired her two months earlier, but had finally given up a few weeks into their relationship. Now he just looked at her with frustration. He didn’t understand, but calling someone by their first name meant forming a connection. Which meant she’d feel something when she had to leave in the middle of the night. Because he’d come after her. No change in that variable. David chose to let the matter go, his attention already diverted to the next piece of business at hand. “I need you make the changes I’ve indicated to the report before you leave, please.” David’s limp was more pronounced today. It usually appeared whenever he was tired or stressed. And David Delaney had plenty of reason to worry. This new contract for a hundred head of cattle would either make or break the new ranch. Which meant she might not have a job in a few weeks’ time, a problem she didn’t want to have to deal with so soon. “Yes sir. I’ll get right on them,” Kara said and waited for him to leave. David turned to go but something kept him from doing so. “Are you sure you’re OK?” He turned to her and asked once more. The gravelly voice washed over her, charming as always. Kara drew in a steadying breath then looked at him. The kindness in his eyes had been there many times before, but today, when she was feeling more lost and alone than she had in a long time, it was almost her undoing. She’d give anything to be able to tell him the dark secrets of her heart. She sensed his presence behind her. She could almost feel him struggling with his conscience. David Delaney was a rare breed of man. She’d learned that in stages over the past few months. David possessed a kind heart. In her experience, that was about as uncommon as a sunny day this time of year in Colorado. She held onto her breath until it hurt, praying he’d leave her without questions. Her desperate need to believe in human kindness again had her hoping he wouldn’t. The silence lengthened uncomfortably, and she turned to find him still there, still watching her. Their eyes locked. A thousand different questions passed between them before he quietly left her to her solitude. Kara let go of the breath she’d held onto, sneaked a quick peek back at his door, and then picked up the phone to call Amy once more.